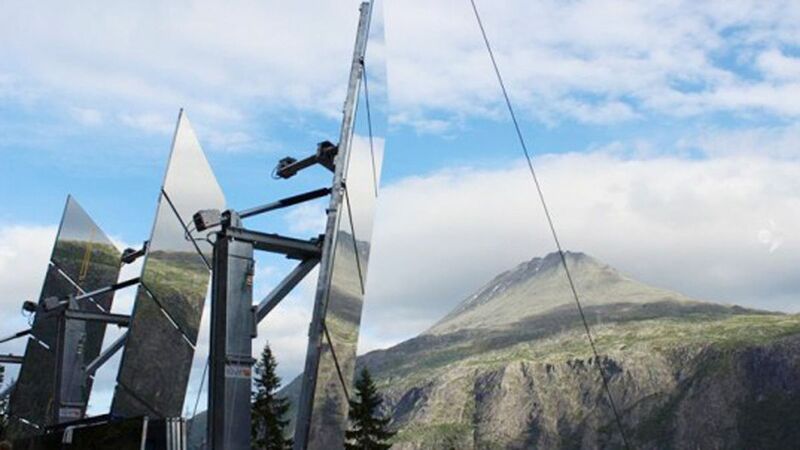 As part of The Mirror Project, engineers have begun installing three enormous rectangular mirrors on the face of the mountains that hem Rjukan in on either side. The mirrors will reflect sunlight down into the town square and become a sunny meeting place. The 328-square foot mirrors are heliostatic mirrors, which are normally found on solar farms, and are controlled by a central computer. A solar-powered sensor will track the sun and allow the mirrors to tilt so that the most optimal amount of sunlight is reflected. The city is spending $835,000 on the project. Helicopters recently installed the mirrors this month, as first tests are slated for September. A 2,000-square foot circle of sunlight will eventually light up the town square, which will soon install an ice skating rink. How this sunshiny project will effect Norway’s infamous black metalscene remains to be seen. I for one would love to see some face-painted Satan-worshiping metal heads don pairs of ice skates as they perfect their butterfly jumps and triple axels. I mean,they’ve already taken up surfing.